Thank you for signing ETAN's petition opposing the Appeal to Conscience Foundation's award to Indonesia's President SBY. While he did come to New York and did get the award (handed to him by no less a war criminal than Henry Kissinger) - we and you did succeed in contributing to the controversy surrounding the ceremony. At our demonstration outside the hotel, we spoke to Indonesian and other media. We learned that ticket sales were so slow that Indonesian students on the U.S. east coast were offered $100 to attend the ceremony. We were also told that the Indonesian Foreign Ministry blamed the churches under siege, Human Rights Watch and ETAN for the controversy. Gisteren had ik een indringend gesprek met Benny Wenda. Wenda is de tribale leider van de onafhankelijkheidsbeweging van West Papua. In 2002 ontsnapte hij uit de Indonesische gevangenis waar hij na een politiek proces was opgesloten en gemarteld. 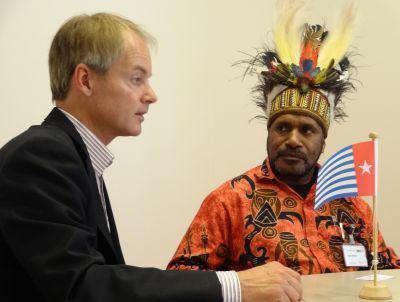 Reviewing the many problems menacing the Papuan people, the question arises: Is there still a role to be played by non-governmental organizations, including religious institutions and their leaders? It appears that there is hardly any NGO powerful enough to influence government policies. NGOs are less well organized and less qualified than a decade ago.